Former British PM says Arab countries would be willing to be more flexible in normalizing ties with Israel if peace talks resume. 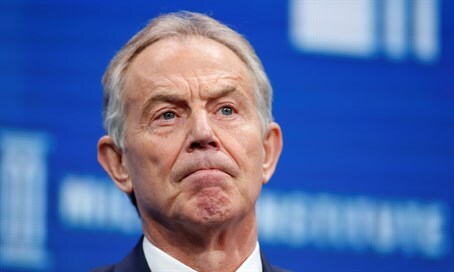 Former British Prime Minister Tony Blair said on Tuesday that if the Netanyahu government agrees to negotiate with the Palestinian Authority on the basis of the Arab peace initiative, Arab states would be willing to take steps to normalize their relations with Israel, Haaretz reported. Speaking at a conference in London, Blair said that there’s a chance, under the present circumstances in the Middle East, that Arab countries would be willing to be more flexible in framing the outlines of their initiative and take normalization steps while Israeli-Palestinian negotiations were underway, rather than waiting for a permanent status agreement between Israel and the Palestinians. “Provided the Israeli government is ready to commit to a discussion around the Arab peace initiative ... it would be possible to have some steps of normalization along the way to give confidence to this process. With the new leadership in the region today that is possible. A lot will depend on the response of the Israeli government to [Egyptian] President Sisi’s initiative and to the Arab peace initiative, and to whatever steps the Israelis are ready to take,” he said, according to Haaretz. Blair was referring to the Egyptian President’s call last week on Israelis and Palestinians to seize what he said was a "real opportunity" for peace. The comments were welcomed by Prime Minister Binyamin Netanyahu, who stressed that "Israel is ready to participate with Egypt and other Arab states in advancing both the diplomatic process and stability in the region." Palestinian Authority (PA) chairman welcomed Sisi’s call as well, saying he welcomed the Egyptian president’s efforts to achieve peace and establish a Palestinian state. Blair said in his remarks Tuesday that due to the deep distrust between the Israeli and Palestinian leadership and the difficult political constraints under which the two sides are operating, active involvement by Arab states in the process is a key to its success. “We need to broaden the support base for the peace process … We need the help of the region. The door between Israel and the Arab states is now closed and the key is progress with the Palestinians,” he said, according to Haaretz. The comments come on the heels of reports last week that Arab countries, including Saudi Arabia, the Gulf states, Jordan and Egypt, are prepared to discuss with Israel changes to the Saudi peace initiative in order to resume peace talks between Israel and the PA. Even though Blair ended his role as the Quartet’s representative in the Middle East several months ago, he has continued to operate independently in an effort to promote the renewal of the peace process between Israel and the Palestinians, and between Israel and the Arab world. In fact, a report last week indicated that Blair was one on a list of several international figures behind the failed move designed to legitimize the addition of the Zionist Union to the coalition, and thus enabling the resumption of Israel-PA peace talks. In recent months Blair has been in Israel and other countries in the region every two-three weeks, meeting with Netanyahu on almost every occasion, as well as with opposition leader Yitzhak Herzog, updating them on his talks with Arab leaders, noted Haaretz. The constant message he bears is that there is a willingness and preparedness in Sunni Arab states to bring about a breakthrough in relations with Israel, but that this depends on taking steps in Judea, Samaria and Gaza that would demonstrate Israel’s seriousness in striving for a two-state solution.